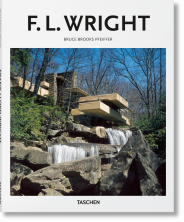 This third and final volume in TASCHEN’s tribute to Frank Lloyd Wright presents later works, the “living architecture” period, and Wright’s revolutionary use of solar energy and curved open spaces. The tome charts major works like the Guggenheim Museum and the Beth Sholom Synagogue through hundreds of archival images and documents sourced directly from the architect’s records. Part of an exhaustive three-volume monograph featuring all of Wright’s 1,100 designs, both realized and unrealized. This volume covers the postwar years and the “living architecture” period. 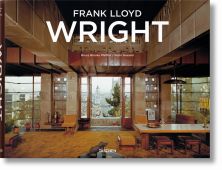 Frank Lloyd Wright (1867–1959) was one of the fathers of modern architecture; his work helped define the modern era, had a widespread cultural influence, and remains highly influential today, half a century after his demise. The mature work of his final years is the subject of this monograph, including all his designs from that period, even those never built. Based on unlimited access to the Frank Lloyd Wright Archives in Taliesin, Arizona, this penetrating study gives an unrivaled overview of Wright’s groundbreaking work and eventual ”starchitect” status—included are drawings he made for an unrealized house intended for Marilyn Monroe and Arthur Miller. Together with two forthcoming companion titles, this monograph will cover Wright’s entire oeuvre, from his early Prairie Houses, through the Usonian concept home and “living architecture” buildings, to late projects like the Guggenheim Museum and his fantastic vision of the “living city.” Author Bruce Brooks Pfeiffer, who served as Wright’s apprentice during the 1950s, highlights the latest research and gives fresh insights into the work, providing new dates for many of the plans and houses. A wealth of personal photos also illustrates the working routine at Frank Lloyd Wright’s fellowship. 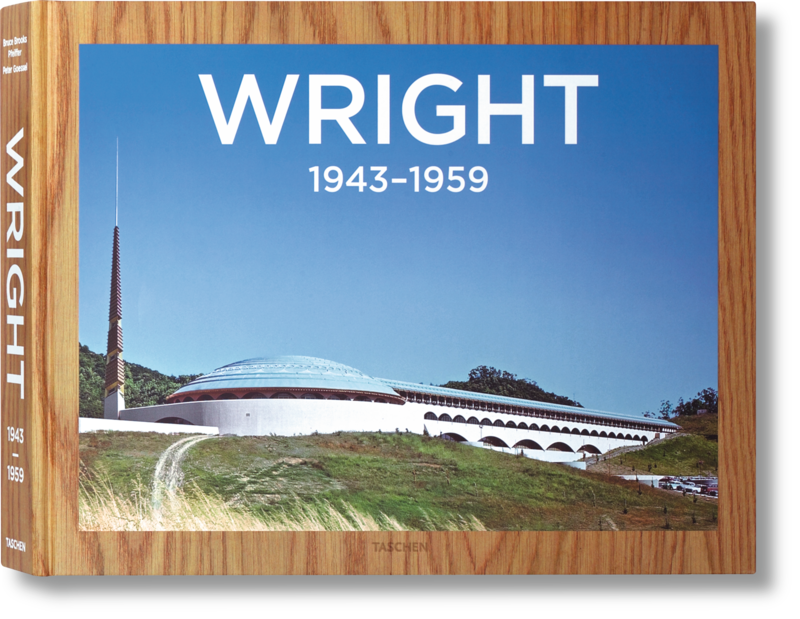 This volume starts in 1943, when Wright’s organic “living architecture” introduced ideas for the use of solar energy and curved open spaces. In addition to many private projects and the Guggenheim Museum, the period up to 1959 includes Wright’s astonishing plans for a new Baghdad; his only realized high-rise tower in Bartlesville, Oklahoma; the crystal figure of the Beth Sholom Synagogue in Pennsylvania; and plans for an endless row of houses with floor plans based on hexagons.